Over 75 free channels available. 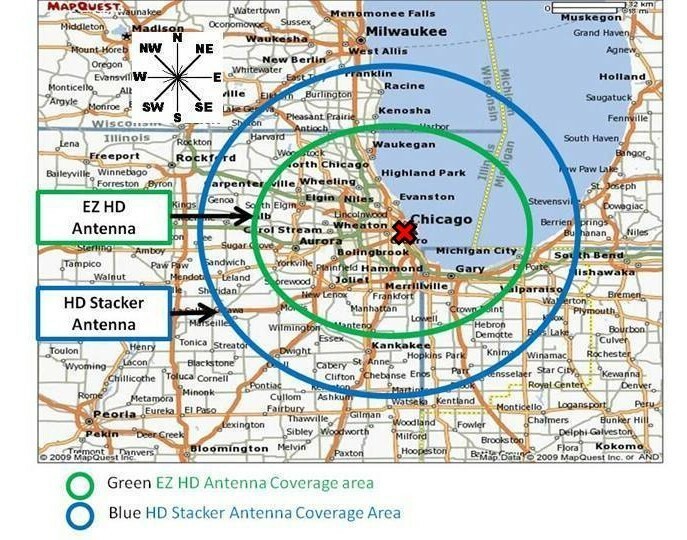 The Chicago TV station reception map below is compiled from actual customer reports using either the EZ HD or the HD Stacker TV antennas. If the TV antenna location is inside of the Green circle on the map below use the EZ HD TV antenna. If the antenna location is outside of the Green circle but within the Blue circle use the HD Stacker TV antenna. TV reception from Chicago TV stations outside of the Blue circle is possible but is hit and miss. Both the EZ HD and the HD Stacker TV antennas have been physically fine tuned to receive the Chicago area TV stations digital TV signal frequencies currently in use. *Map is based on the weakest Chicago, IL TV station transmitting signal. The EZ HD and the HD Stacker antennas are physically tuned to receive the specific TV signal frequencies in use by the Chicago TV stations. Inch for inch both antennas will outperform any other antenna on the market. We guarantee it or your money back. Note: Some Chicago area residents have reported problems receiving WBBM channel 2.1 CBS when using antennas other than the EZ HD or the HD Stacker. This is due to the VHF broadcast frequency in use by WBBM and the use of the improper antenna to receive VHF signal frequency. Many of today's antennas (do to smaller antenna size) will not receive VHF signals. The EZ HD and the HD Stacker are designed to provide excellent performance across the entire frequency spectrum in the Chicago broadcasting market. Antenna Aiming - From the antenna installation site aim the narrower end of of the antenna at the Red X on the map above to receive the Chicago TV stations. Tweaking the antenna direction for best performance. Using the TV tuner signal strength meter determine which Chicago TV station has the weakest signal. Now adjust the antenna direction to the peak signal strength of that station. The Chicago TV station reception map above is based on the use of the EZ HD and HD Stacker TV antennas installed in an outdoor location at an elevation of at least 20 feet above ground. TV antennas located indoors such as attics etc. will likely experience reduced reception range. Antennas installed at an elevation greater than 20 feet above ground will likely experience increased reception range and antennas installed less then 20 feet above ground will likely experience reduced reception range. The closer the TV antenna installation site is to the transmitters (X) the lower the antenna can be installed to the ground. Best indoor TV antenna for the Chicago area. We have tried a lot of indoor TV antennas in the Chicago area and found the 402VG to work best. Technically the 402VG is an indoor/outdoor antenna and is larger than the paper thin flat antennas etc. However, the increased performance is well worth the additional size. I want to thank all of our customer's who have and continue to contribute reception reports from the Chicago area. You have helped create a very reliable DTV reception map for the entire Chicago TV station viewing area. Have a question about TV Antenna for Chicago TV reception??? 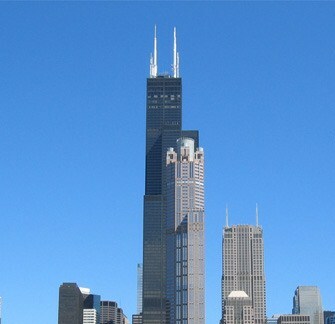 Above: Free to air TV broadcast antennas on top of the Chicago Willis (Sears) Tower.